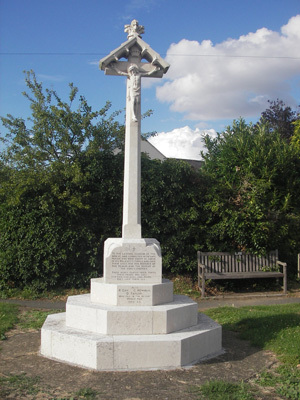 The Alderton war memorial is a stone cross at the junction of Willow Bank Road and St. Margaret's Road, Alderton, Gloucestershire UK. 1. In the World War 1 listing, the way V.Pullom is out of order and A.Taylor has a full stop after (unlike the other names that had comas) it looks as if V. Pullom was added after the original names. 2. R. AGG. Surname corrected. Due to erosion of the inscription the entry was originally listed as R. ACC. Listings and photograph provided by Evan Lewis August 2013.